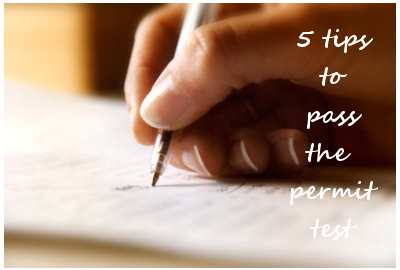 5 Easy Ways To Prepare for and Pass Your Permit Test Today! Most of us make a decision to get behind the wheel and start driving at some point and taking the first step towards obtaining a drivers license is always the hardest step. You don't know what's required of you, where to go, what to study and most of us are afraid of taking a drivers permit test, which is no wonder, with more than half of all test takers failing the exam the first time. If you want to be among those who pass the permit test the first time they take it, follow these quick and easy tips! There is simply no overstating of how important it is to read the drivers handbook before you do anything else. Every state publishes its own version of the driver's manual and the book truly has it all: applicable driving laws, road signs, a list of documents you need to bring with you to apply for a drivers license. Most driving manuals will also have a lot of helpful information about the driving test you will need to take in the future. Obtaining the book is very easy: all you have to do is log into your state's DMV website and you can usually locate it there. The book can be downloaded to your computer, a cell phone or you may even choose to print it out and keep it with your at all times. Some states even have printed copies of the book available at DMV offices, but they may charge you for it and why would you want to waste a trip to the DMV anyway? The great news is that in most cases, your learner's permit test will be based on the information that appears in your state driver's manual so you do not have to pay for expensive drivers education classes (of course, if the state requires you to take one, there is no way around it). Reading the handbook should always be the first thing you do when you start preparing for the learners permit test! This is probably an elaboration on the first tip: you have to take notes as you read the drivers manual. Some people just read the manual as if they are reading some fiction book, skipping pages and not paying attention to places that look boring. This is one thing that is almost certain to get you failed on your learner's permit test. Remember that the passing score for the permit test in most states is around 80%. That means you can miss 2 out of every 10 questions at most. Some states require you to answer ALL questions about road signs without allowing you even a slightest chance for error. Skipping a few things may cost you the whole knowledge test. When you dedicate time to read the handbook, make sure to have a notebook ready and write out any points that seem important. This means any laws that concerns blood alcohol levels, speed limits, following distances. Having concise notes on these subjects will help in the future. This is another technique that is frequently disregarded by those studying for the driving permit test. Flashcards can be of great help to anyone who wants to pass the permit test the first time, they really help those rules to stick. It's just the way our brain functions: when we see something every day for a long time, we memorize it, whether we want it or not. Let us stop here and mention that when we are saying “flashcards”, we do not mean online flashcards you can find on various websites. Sure, those are useful too, but flashcards that you make with your own two hands will help much better. They are not hard to make, after all, they are simple squares of paper with a question written on one side and the answer on the other side. To save time, you can make flashcards only for those rules that are really hard to remember, you do not have to make flashcards that cover all permit test questions. This is an obvious tip, but we wanted to make sure we've got everything covered. Taking a permit practice test that covers your state driving rules, road signs and traffic laws can be one of the most useful study aids, provided you know how to use it. Sadly, most people don't. One of the biggest mistakes you can make is to start taking practice tests before you read the drivers manual. Sure, you can usually answer 6 or even 7 questions out of 10, but this will not help you pass the real permit test! You will always be missing those hard questions you did not study for and you will miss those exact questions during your real permit test too! We do believe that sample permit test questions contained in practice tests help immensely, but we urge you to read the drivers manual first, taking notes as you go, and then proceed to taking samples quizzes. When you miss a question on the practice exam, write it out and research this information in the drivers handbook, then add it to your notes. Keep doing this over and over again and you will see how quickly your score will improve! This is another one of those obvious tips that will help you pass your permit test - start early, don't try to learn the rules of the road in one day. In most cases, it will not work, there are just too many rules to remember, too many signs to learn and we actually want to commit these rules to our long-term memory, since we will be using these rules our whole life. When you are asking yourself a question “how early should I start studying for my permit test”, you should be able to answer it yourself. Different people have different learning curves and some people memorize things faster than others. We advise that you spend at least a month working on the handbook, practice tests and flashcards before you visit a local DMV office and take the permit test. A fortnight is an absolute minimum, but we would not recommend anyone to try and cram everything into their brain in such short time. Remember that passing the permit test is easy if you study and come prepared! More than half of students fail the learners permit test the first time they take it, but you do not have to be among them!